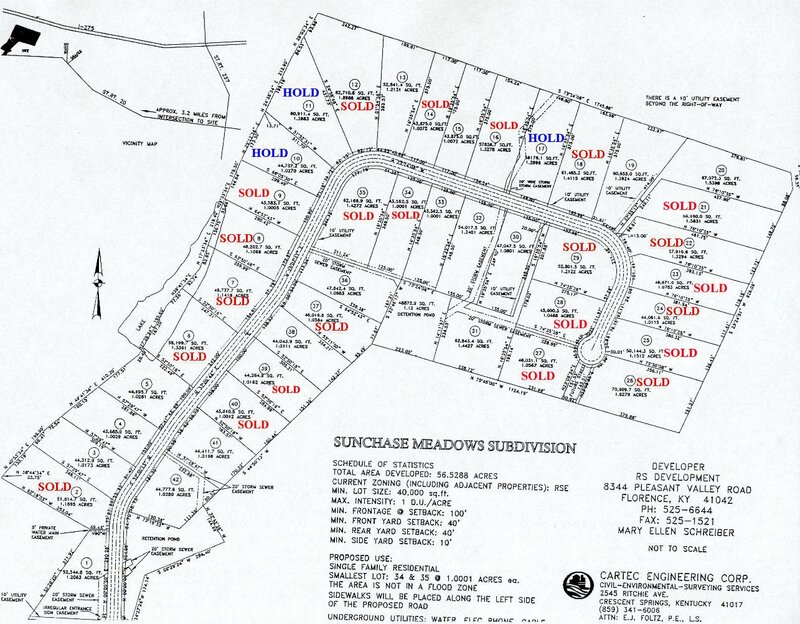 Welcome to Sunchase Meadows, located in beautiful Burlington, KY. Sunchase Meadows provides a scenic country atmosphere with very spacious acre+ size lots. A great location for the person wanting a larger lot for their dream home. This subdivision is in a very convenient location being only minutes away from I-275. Other Builders and Individuals Welcome. From I-75 Merge onto I-275 West by taking exit 185 towards the airport. Take the KY-237 South exit (exit number 7B) towards Hebron. Merge onto North Bend Rd/ KY-237. Turn right onto Petersburg Rd/ KY-20. Sunchase Meadows is approximately 4 miles on your right. From I-275E Take the Hebron exit (exit number 7). Turn right onto North Bend Rd/ KY-237. Turn right onto Petersburg Rd/ KY-20. Sunchase Meadows is approximately 4 miles on your right. From I-275W Take the KY-237 South exit (exit number 7B) towards Hebron. Merge onto North Bend Rd/ KY-237. Turn right onto Petersburg Rd/ KY-20. Sunchase Meadows is approximately 4 miles on your right.